Photo courtesy of Jo Cooks. If you needed an excuse to eat more Mexican food, Cinco de Mayo is almost here. The countdown to tacos and tres leches cake is on. We hunted down some of the best melty, creamy, and crunchy Mexican recipes for your Cinco de Mayo table. Is anything better than queso? Hold the velveeta for this traditional Queso Fundido that features chorizo sausage and a blend of Mexican cheeses. Another traditional south of the boarder starter would be these Mexican Corn Fritters. These bites are big on both corn flavor and crunch. Serve them with salsas and sour cream for an impressive appetizer spread. If you are looking for a home-run crown pleaser, nachos are always a hit. Try these Restaurant Style Nachos with Chipotle Crema for an instant hit, or mix things up with these Loaded Nacho Fries. Burritos, tacos, and enchiladas might be the bread and butter of Mexican cuisine served here in the tates, but dig a little deeper and there is an extensive variety of delicious Mexican dishes just waiting to be discovered. 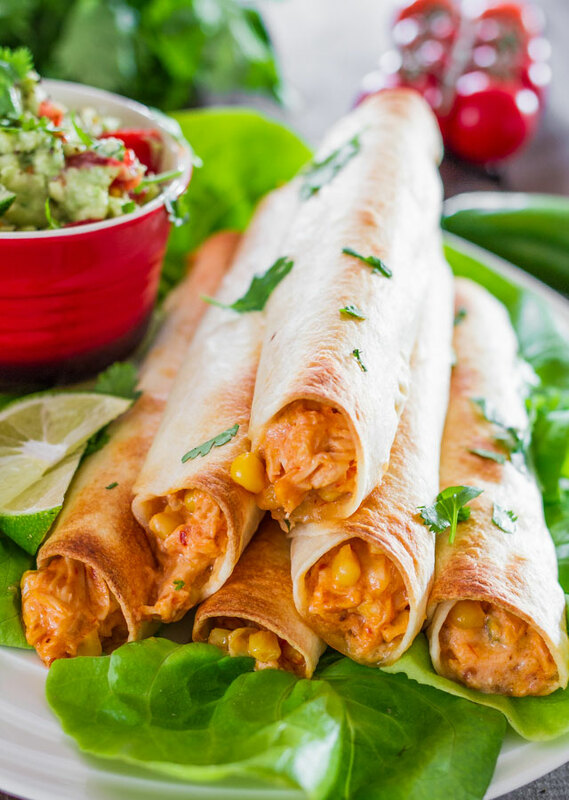 Take these Creamy Cheesy Chicken Flautas for example, they are like taquitos, but wrapped in flour rather than corn tortillas. These Flautas are baked rather than fried for easy at home preparation. Then there are these Authentic Corn Tamales. Filled with sweet corn and corn flour, these easy-to-make tamales are big on flavor. For a meal in a bowl, try this Red Beef Pozole. This Mexican soup is fragrant with ancho and guajillo peppers, garlic, oregano, and rich pork shoulder. Is a Mexican meal complete without sauce? Whether it is Red Charred Salsa for your tortilla chips, Tomatillo Sauce for your tamales, or this Cinco De Mayo Guacamole for everything, the sauce often makes the meal. For a unique twist, whip up this Mole Sauce and serve it over chicken. If you are looking to add some gourmet spice, this Guajillo Chile Hot Sauce deserves a place on your table.